It was 65 years ago Sunday. In 1947, Jackie Robinson became the first black American to play professional baseball for Major League Baseball when he took the field for the Brooklyn Dodgers. Things change: the Dodgers moved to LA, Jackie Robinson retired, and 15 years ago the MLB retired Jackie Robinson’s #42 jersey across the entire league. 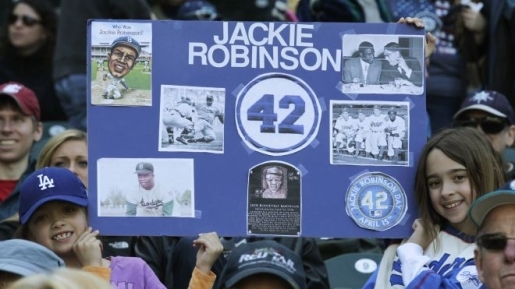 Last night, everyone was wearing #42 in tribute to Jackie Robinson’s legacy. At the time of the rule change, players currently wearing 42 were grandfathered into it. These days, only one player wears 42 as his actual number in the Majors, and that’s Curtis Granderson’s New York teammate, Mariano Rivera. However, Robinson’s legacy lives on in another Yankee. Yankees second-baseman Robinson Cano, born in the Dominican Republic in 1982, was named after Jackie Robinson. Cano wears number 24, the inverse of Robinson’s 42, in tribute to his namesake.